The amazing Chia Seed. Chia seed is the most nutritious seed available anywhere and among the best health-building super foods or nutritional supplements around. Chia seeds promote health to everyone who takes it. Chia seeds will actually reduce cravings for sweets and junk type foods. These miraculous little seeds help slow digestion, sustain balanced blood sugar levels and have high soluble fiber content because they are able to absorb so much water. They release natural, unrefined carbohydrate energy slowly into the bloodstream to keep you feeling “fuller” for longer periods of time. Often times you will hear people refer to Chia seeds as an ‘almost perfect food’ and one or two tablespoons a day is all you need of this “power food”. Improve mental focus and concentration. Chia’s balanced essential fatty acids can significantly boost brain power and brighten moods. 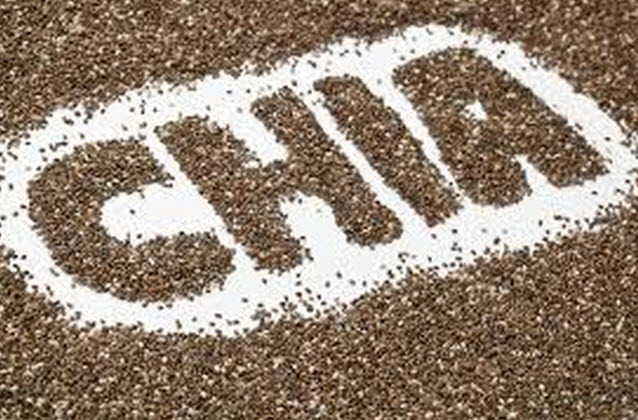 Gluten-free: Unlike grain-source proteins, chia seed protein contains no gluten. For those sensitive to or worried about gluten this is your answer. Chia provides 97 percent of its calories from high quality plant protein and lipids with very few calories coming from carbohydrates. The carbohydrate portion of chia is predominantly insoluble fiber which is beneficial to digestion in that it passes through the gastro-intestinal tract undigested resulting in a non-caloric effect to the body. Without a doubt, gram for gram chia is the highest source of protein you can consume. Chia’s soluble fiber (hydrophilic colloids) massively retain water keeping you well-hydrated and your electrolytes in balance. Your hair, skin, nails, will all benefit from chia seeds They reduce inflammation and muscle soreness and spped up rejuvenation. And, don’t forget the pets you might have. Chia seeds are excellent for keeping your pets healthy and vibrant. Use ½ teaspoon a day for a cat or small dog and a teaspoon for larger dogs mixed well into their food. Make sure ton soak them in a little bit of water first for a few minutes before adding to their food because chia seeds can absorb up to 40 times their weight in water and your pets would easily dehydrate if your fed them dry chia seeds. Chia seeds are great added to oatmeal or for a sweet treat without the processed sugar, put them in a bowl with unsweetened chocolate almond milk-they absorb the liquid and gelatinize and end of similar to the consistency of rice pudding. Note: You can change it up and make it more nutrition by adding a few chopped nuts. Place all ingredients in a blender and blend until smooth and creamy. Take the mixture out of the blender and allow it to thicken for a few minutes (if you can wait that long)! Enjoy this anytime you want something nutritious, delicious and easy!